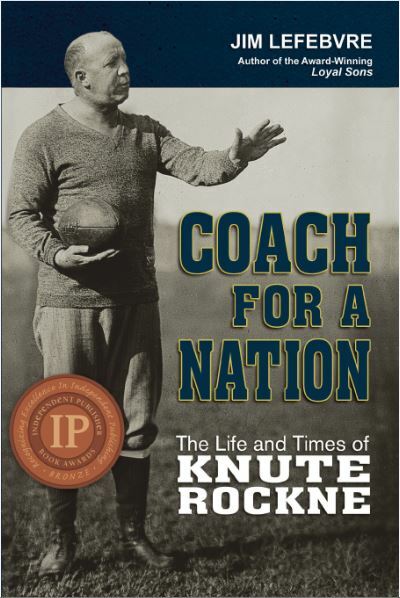 In Coach for a Nation, the reader sees Knute Rockne’s rise from immigrant child to Notre Dame coaching legend to revered national figure speaks to the endless possibilities of the human spirit. Rockne’s visionary genius and engaging personality made Notre Dame football a household name from coast to coast. SKU: 9780981884141. Categories: Sports & Recreation, Football. Tags: coach, coaching, football, Jim Lefebvre, Knute Rochne, Notre Dame. He transformed the game of football, gained a legion of followers, and inspired a generation. In Coach for a Nation, the reader sees Knute Rockne’s rise from immigrant child to Notre Dame coaching legend to revered national figure speaks to the endless possibilities of the human spirit. Rockne’s visionary genius and engaging personality made Notre Dame football a household name from coast to coast. He helped create a new game, wide open and more appealing to fans, then taught it to coaches everywhere. Upon his shocking death in 1931, the outpouring of sentiment was unprecedented. In Coach for a Nation, we learn what caused this emotional bond between Rockne and his adopted country. Jim Lefebvre is an award winning journalist, author, and sports historian. 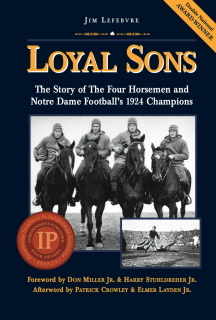 His book Loyal Sons was honored with three national awards for excellence, including an IPPY Bronze Medal in 2009. Jim is founder and curator of the online magazine Forever Irish, which celebrates the heritage of Notre Dame football, and is editor of the e-newsletter Irish Echoes. He is a member of the Intercollegiate Football Researches Association and the Biographers International Organization. Beyond Just Win tells the inspirational story of Texas high school football Coach G.A. Moore, who won more games than anyone in the storied history of Texas high school football. During a 45-year career, he amassed 429 victories and eight state championships numbers that place him well above other coaches. But Moore’s influence extended far beyond winning football games. He shaped the character of two generations of young men. To Moore, winning wasn’t everything. He wanted to win while maintaining good sportsmanship. He demanded that his players be exemplary people on and off the field. If they disrespected a teacher in class, they paid for it at practice.